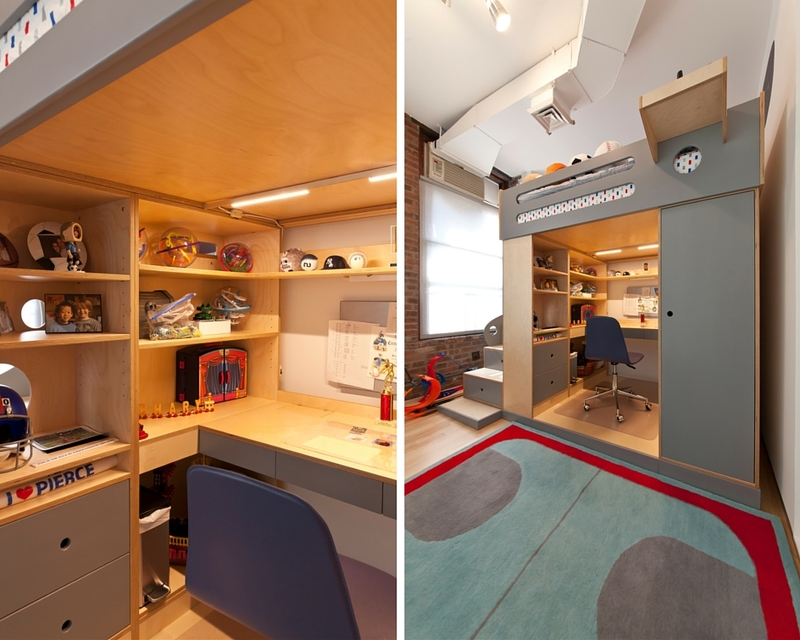 Zach's Room: A full size loft bed doubles storage space. In an East Village apartment, we designed custom furniture for Zach's new room. Since Jack is an older child, we decided to customize our Dumbo loft to fit a full size bed. The bigger bed not only gives Zach, more than enough space to sleep, but also adds to the storage capacity underneath the loft. The underside of the loft features a full size desk, storage drawers and plenty of open bookshelves where Zach can display his trophies and other collectables. Just outside the loft, we designed one side of the loft to be a deep closet. To appeal to the older child, we added gray accent colors to compliment our natural birch finish.